Time: 5 hrs. 30 mins. 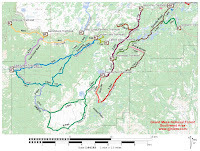 Indian Point is located on the rim of the Grand Mesa to the south of Kannah Creek Basin. 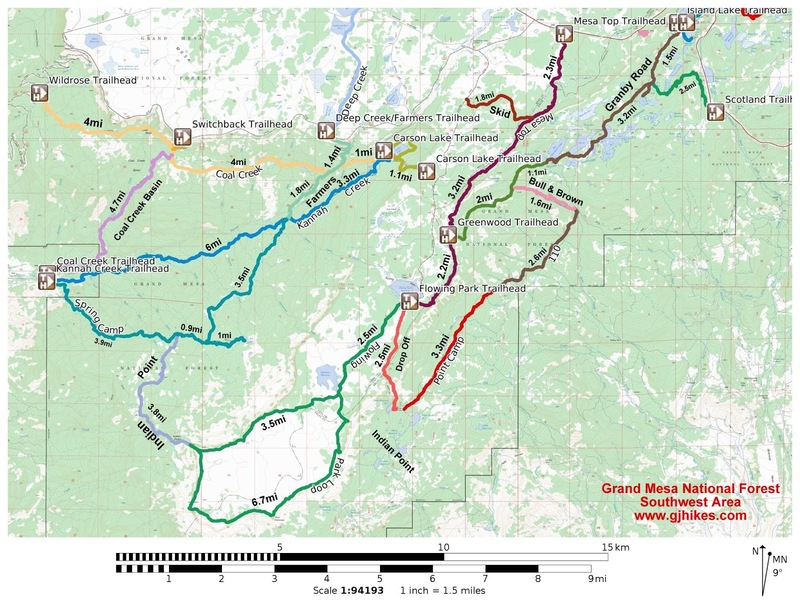 Indian Point can be accessed from Flowing Park Reservoir, on top of the Grand Mesa, and also from the lower valley by beginning at the City Intake trailhead. This hike begins at Flowing Park Reservoir and follows the Indian Point trail across the top of the mesa to Indian Point. This hike was probably the easiest and most pleasant 12 miles that I have ever done. We drove up the Grand Mesa on Highway 65 to the Lands End road and drove west on Lands End and took the first turnoff to the left on the 109 road. It is about a 5-6 mile drive down the 109 road to Flowing Park. The road is passable with a car in good weather. When we arrived at Flowing Park Reservoir we followed the road around to the south side of the lake. There is room for 5 or 6 vehicles to park just before a pair of green Powder River gates. The map shows this to be the trailhead but other than a sign for the 726 Drop Off trail there are no other signs or kiosks. We grabbed our gear and passed through the gate and began hiking up the road. We followed the road for about 3/4 a mile when we came to the first sign for the 715 Indian Point trail. We got a couple of good pictures of a coyote coming out of the trees right around this spot. After about 2 miles of easy hiking we were passing the area of Chambers Reservoir. We came to the beginning of the 756 Flowing Park Loop trail at about 2.25 miles. The 756 trail breaks off and heads mostly south before bending westerly to the rim of the mesa and then continuing to follow the rim back to the north where it rejoins the 715 Indian Point trail just before it reaches Indian Point. We reached a fence that divides the pastures in this area at about 2.75 miles. The cows have stretched the wire so much that the gate was pretty easy to handle. At about 3 miles the trail enters a grove of pine trees. It was so dark that I was surprised that the flash on the camera didn't go off. The trail began alternating between open spaces and Aspen groves with an occasional pine grove. The trail approaches the rim of the mesa above the Kannah Creek Basin. The small lake that you can see in the upper area of the basin is Blue Lake. The cliffs of the mesa are several hundred shear vertical feet along hear so if you have kids in tow you might want to keep the close. The trail never gets very close to the edge so there isn't much danger in going over as long as you are on the trail. There are some incredible views of the San Juans to the south. I could see about 7 of the 14,000 foot peaks of that range. To the west the La Sal mountains in Utah dominate the horizon. The last mile or so before reaching Indian Point began getting a little monotonous. The trail bends away from the rim before heading back out to the point. It is well worth the effort to keep hiking to the point where the spectacular views enliven the mind and effort it took to get there is quickly forgotten. Another effort that will be well rewarded is to hike down the trail from Indian Point for 100-200 yards and check out the ridge that leads away from the point and admire the monumental effort that went into making that section of the trail. Looking down across the valley to the west past Cheney Reservoir you can see, from right to left, Unaweep Canyon, that leads to Gateway and beyond, Big Dominguez Canyon and Little Dominguez Canyon. It had taken us about 3 hours to get to Indian Point from Flowing Park Reservoir. We probably spent about a half hour at the point before heading back. We saw at least 6 different Peregrine Falcons. When they weren't flying around screeching up prey they were roosting in the tops of dead trees where they made for easy pictures. Just past Chambers Reservoir we saw 3 falcons perched in trees and another one flying around. I never realized that so many falcons shared the same territory. We arrived back at the trailhead in only about 2 hours. The road above the trailhead is lined on both sides with raspberries. When we were here a couple of weeks ago we filled a bag with berries. This time there were even more berries that were ripe but we ate every single one that we picked. We each drank about 100 ounces of water and Gatorade that we had packed in. There wasn't any flowing stream water to filter and the only other water was in the stock ponds so you should probably plan on bringing what you need. This section of the Indian Point trail probably gets more bike and horse travel than it does hikers. It might be one of the easiest mountain bike trails on the mesa. There were more trail markers than I have seen on any other trail. Once you turn off the road onto the 715 trail you can almost see from one marker to the next for the rest of the way. Indian Point made for another nice day on the mesa. If you would like to see it for yourself then all you have to do is 'Take a hike'.